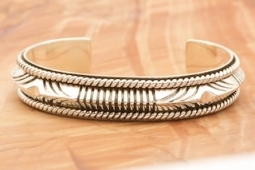 Stunning Design in this Bracelet Created by Master Silversmiths Navajo Artists Artie Yellowhorse and Henry Chackee. Signed by the artists. The bracelet is 53 grams of 925 Sterling Silver.